Mikhail Ivanovich Glinka (May 20, 1804, with Novospasskoye Smolensk province – February 3, 1857, Berlin,. Is buried in St. Petersburg) – was the Russian composer of world significance. In the face of M. Glinka’s Russian musical culture for the first time put forward the global importance of the composer. 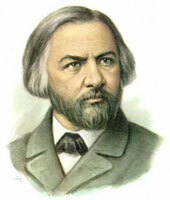 Glinka completed the formation of a national school of composition, which has won in the XIX century. one of the leading places in the European culture, became the first Russian classical composers. This entry was posted in Air, Glinka, Mikhail, Opera, Piano and tagged For Voice and Piano, Mikhail Glinka, Music score, Opera, Piano, Sheet music on 12.03.2018 by admin. This entry was posted in Glinka, Mikhail, Piano, Romance and tagged For Voice and Piano, Mikhail Glinka, Music score, Piano, romance, Sheet music on 09.03.2018 by admin. This entry was posted in Glinka, Mikhail, Piano, Romance and tagged For Voice and Piano, Mikhail Glinka, Music score, Piano, romance, Sheet music on 08.03.2018 by admin. This entry was posted in Glinka, Mikhail, Piano, Romance and tagged Bolero, For Voice and Piano, Mikhail Glinka, Music score, Piano, romance, Sheet music on 08.03.2018 by admin. This entry was posted in Glinka, Mikhail, Piano, Romance and tagged For Voice and Piano, Mikhail Glinka, Music score, Piano, romance, Sheet music on 07.03.2018 by admin.